Many people today have restless hearts. 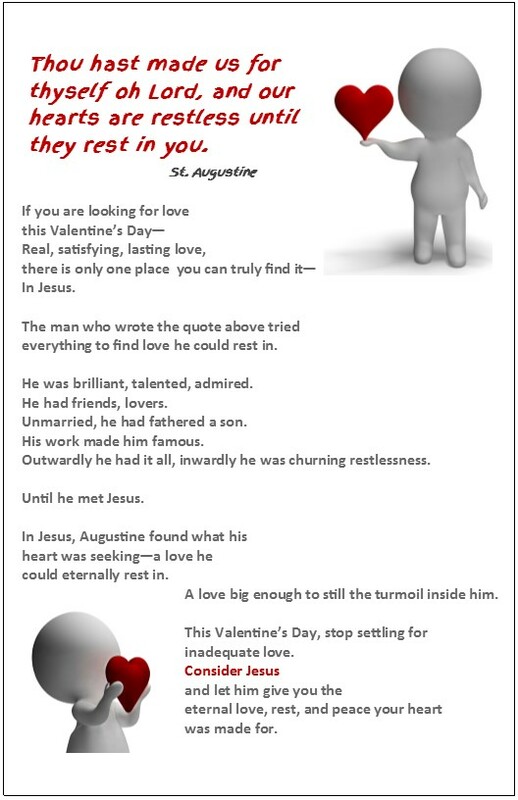 This Valentine's Day, help them find rest in Jesus. Today many people have restless hearts. Life may not be what we wanted, dreamed about, or even find tolerable. 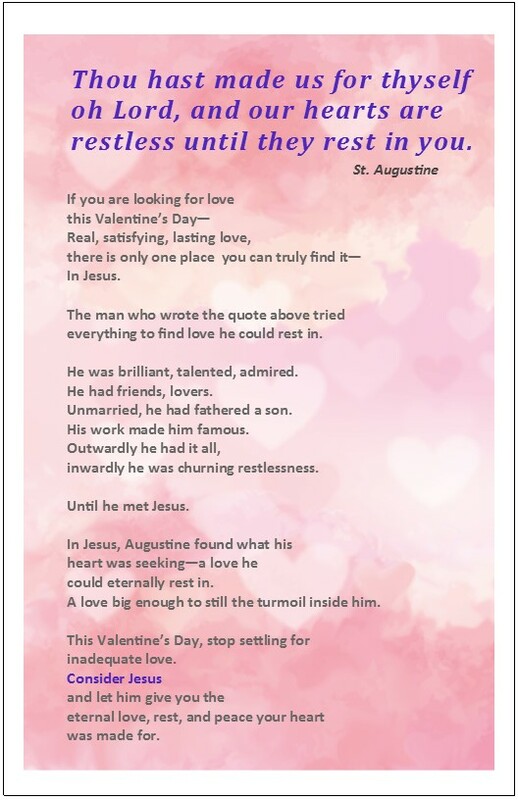 Our restless hearts may be in many areas of life, but Valentine's Day shines a laser focus on the restless disappointments in our hearts. 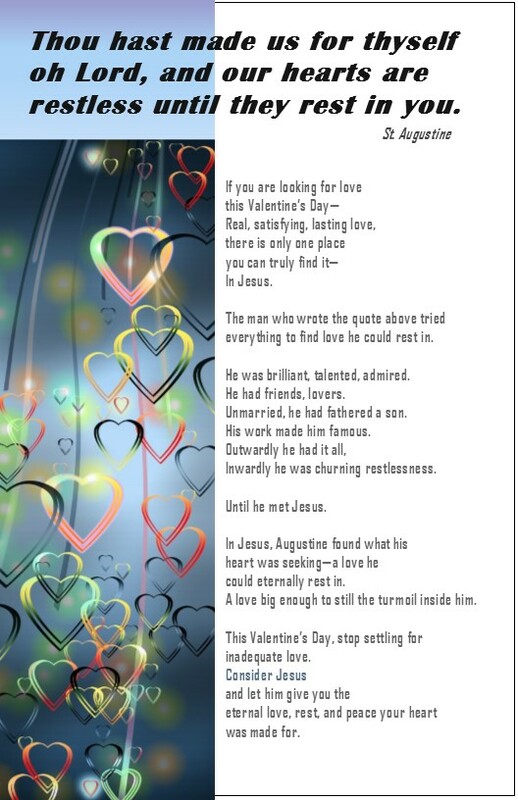 This flyer or Bulletin Insert might help your church minister to those restless hearts. This time of year we're reminded of every romantic disappointment and broken dream with every TV ad and the gauntlet of flowers, cards, and chocolates when we shop. We may be alone in that we don't have a special someone in our life or the special someone slot may be filled, but we still feel alone. The media tells us we shouldn't ever be satisfied until we do everything we can to find that rush of complete, overwhelming, all-consuming, and satisfying human love, to go along with our perfect bodies and leisurely lives. But few of us live in that media fantasy and even fewer have the energy to try to event try make it real. What the media doesn't tell us is that no matter how perfect we are, how much money we have, or how single-mindedly we pursue a perfect human romantic partner that no human love, no matter how deep or true or quietly wonderful it might be, (and some are blessed with that) will ever totally fill the place in our heart only God is designed to fill. 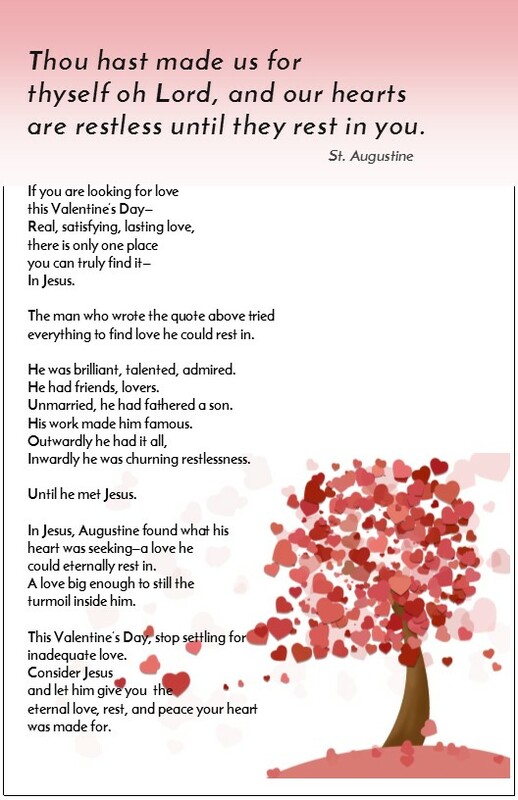 Valentine's Day is a perfect time to share the reality of God's forever satisfying love with the people who come to your church and here is a ready-to-print communication to help you do it. This communication piece, whether you print it up as a bulletin insert, a postcard, or any kind of event hand-out can be an ice-breaker to start conversations or connections with visitors. By adding resources and links, suggested below on the back, it can serve as a tool to start a spiritual search or connections via social media. If your church doesn't use bulletin inserts, feel free to take the message, the text and ideas to create your own communications on-line or in print—the channel that you use isn't important—take the message, the words, the goal to help people find Jesus and grow to mature disciples, and get it out there any way you want. everything to find love he could rest in. He was brilliant, talented, admired. Unmarried, he had fathered a son. His work made him famous. Inwardly he was churning restlessness. If you do up a bulletin insert like this and then on the back put in more material that is specific to your church or to another outreach, you can potentially make the holiday something more than a nice time of celebration, but a turning point for a life. ***Let them know you have people they can email or call if they have questions about the Christian faith. Pick out several that you think might work, research your own, but give people a way to continue to explore a relationship with Jesus. Valentine’s Day is one holiday you know you can speak to the real needs of people, because everyone needs love. Pray lots that your church might use it as a time to channel this God-given desire into a love for Jesus. I found this additional version in my archives and it is one of my favorites. I don't have the original MS Publisher files of it and the artwork asked for attribution (to comply: it is by Billy Alexander from the older Stock XChange site), but I have the PDF and you can download it by clicking on the image. "Thou hast made us for thyself O Lord, and our hearts are restless until they rest in you"
one place you can truly find it—in Jesus. The man who wrote the quote above tried it all. had fathered a son, but he was empty inside. Empty until he met Jesus. seeking—a love he could eternally rest in. fill the empty place in your heart.